A great film, like a lovely song or beautiful painting, has many shades of meaning. If we focus on the main theme, more subtle truths still find their way around our mental roadblocks to touch us in personal, often unexpected ways. God’s love touches us the same way. Hidden by today’s dilemmas, His Word resonates in our lives despite our attention elsewhere. Sometimes we see Him in our films, in our music, in our neighbor, in ourselves. Join me as we look for Him. If you like what you read here, please link your sites to this blog. All posts, except where noted, are © Christopher Fenoglio. If you would like to publish a post in your print publication or on your website, please contact me by posting a comment to one of my blog entries or e-mail me at chrisfig58@gmail.com. Wm. Christopher Fenoglio is a columnist for The Tennessee Register, the newspaper for the Catholic Diocese of Nashville. His features and interviews have appeared in Our Sunday Visitor, The Tennessee Register, and other Catholic newspapers across the country through the Catholic News Service. His column Reel Life was honored by the Catholic Press Association with national awards for 2006 and 2007. An account of his interviews with the director, cast and crew of The Lord of the Rings – The Return of the King was published in 2005 Lembas for the Soul by White Tree Press. A 1980 graduate of the University of Notre Dame with a Bachelor’s of Arts degree in American Studies, Fenoglio studied literature, history, art, government and sociology. He also studied theology and philosophy in 1982 as a seminarian at St. Mary of the Lake in Mundelein, Illinois. During the week he is the web and interactive marketing specialist at LifePoint Hospitals, Inc.
On weekends he serves as a music minister at St. Henry Church in Nashville. He has recorded three albums with renowned soprano Mary Corby: Ave Maria and other Songs of Devotion, O Santissima and other Hymns of Praise, and Emanuel – The Music of Christmas. While a student at Notre Dame, Fenoglio sang baritone with the Notre Dame Glee Club, travelling and singing throughout the United States and Europe. 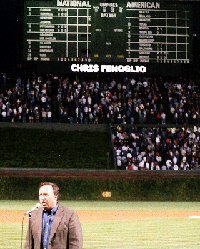 One of his fondest music memories occurred September 27, 2004 when he sang the National Anthem at Wrigley Field before 45 friends and family and 39,000 other ticket holders. Fenoglio sings the Anthem regularly at high school, college, minor and major league sporting events. Christopher lives in Nashville, Tennessee with his wife Linda and their three teenagers. I too dearly love the movie “The Quiet Man”. I have been searching for the exact locations of where this movie was filmed in Ireland – would you have more information?